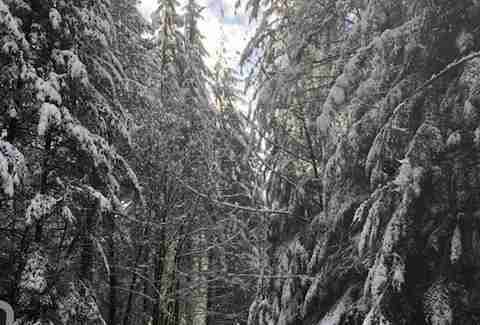 As Scott Brown and his wife were preparing to embark on a snowy trek to a popular waterfall in Washington state this week, they spotted something. There, lingering at the trailhead, was a fluffy black dog. The pup seemed quite content, so it wasn't much cause for concern. "I made a joke to my wife that it was a bear," Brown told The Dodo. It wouldn't be the last they saw of him, though. 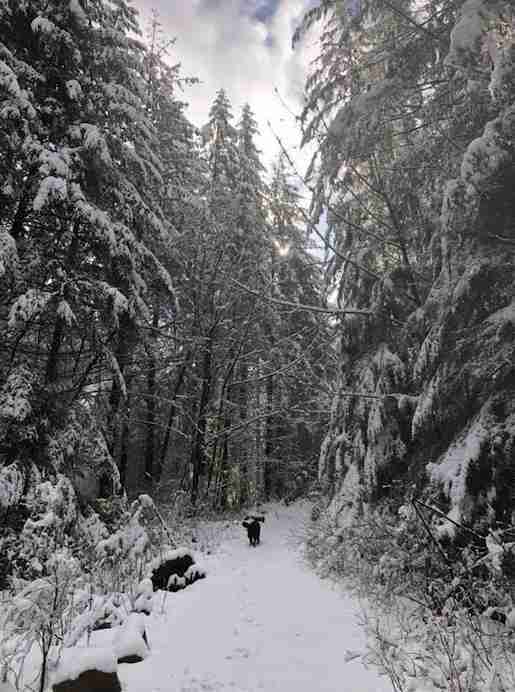 When Brown and his wife began the 7-mile trek, it evidently sounded like a fine idea to the pup. He decided to join them, serving as the couple's guide. "He took the lead anywhere from a couple feet, to way out in front, out of sight," Brown said, adding that the dog seemed understanding of the couple's dilly-dallying: "He would sit and wait for us as we took photos and then continue on when we did." 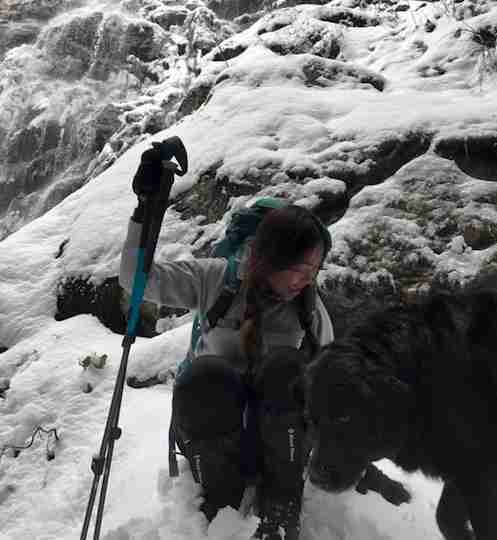 Once they reached the waterfall, Brown snapped some photos with their new canine companion. It was around this time that Brown decided to take the opportunity to better acquaint himself with the friendly dog who, by now, was resting his paws along with them at their destination. Where had this dog come from anyway? Was he lost? 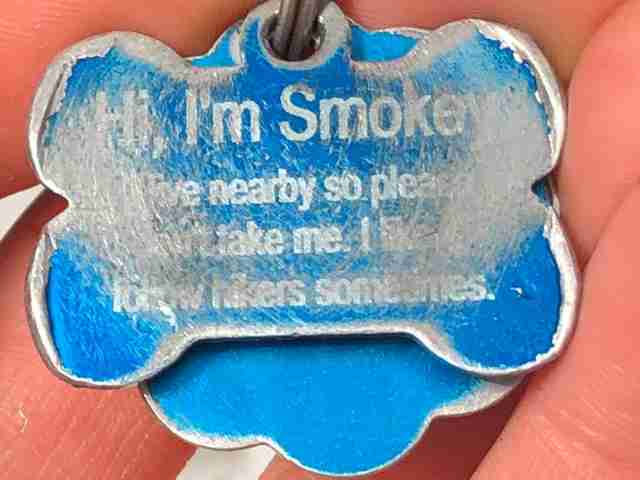 That's when Brown saw what was written on the dog's ID tag — and realized that everything was A-OK.
"Hi, I'm Smokey," the scratched-up tag read. 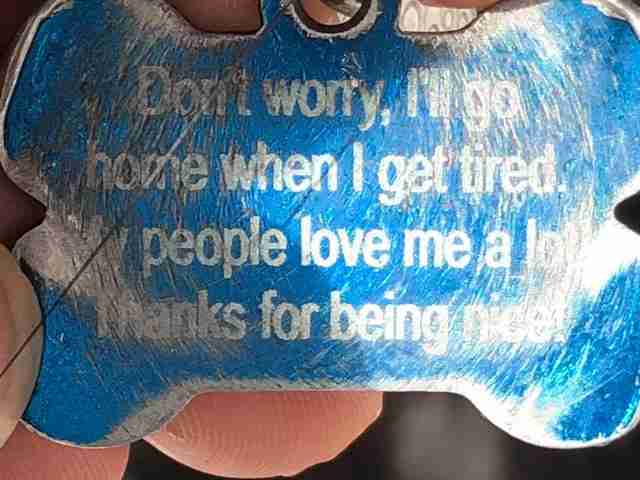 "I live nearby so please don't take me. I like to follow hikers sometimes." "Don't worry, I'll go home when I get tired. My people love me a lot. Thanks for being nice!" Brown and his wife had lucked out. On this fine day, dear Smokey the hiking dog had chosen them. After the stopover at the falls, the couple — now a trio — all trekked back together. Smokey, once again, led the way. 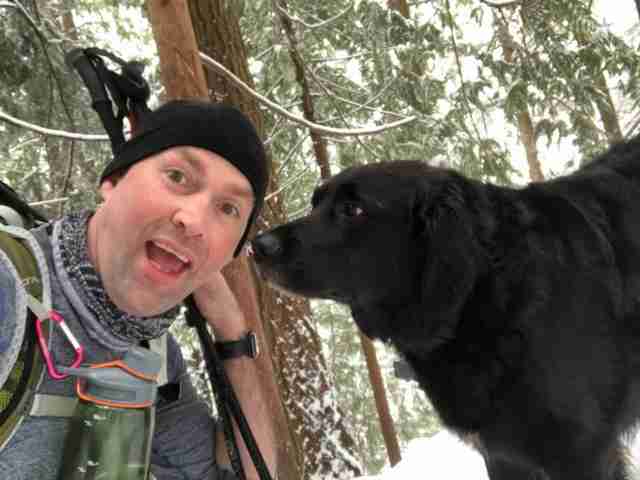 Before long, Brown, his wife and the dog returned safely to the trailhead parking lot where they'd met in the first place — a short distance from the neighborhood where Smokey apparently lives. It's a perfect locale for a dog who clearly loves to hike. "He stayed in the lot until we were all changing near our cars and he calmly walked across the road and back into the neighborhood," Brown said. "At the corner, he gave out a quick bark at us then continued on back home, I assume." So long, Smokey. Thanks for the memories!